But a reply must be sent. An inevitable negative reply to that fearful six word question. A council of philosophers was held and a message decided upon while the semantics bureau busied itself working out a simple code which would be almost instantly intelligible to the Cassiopeians. By our improved helioflash, the message -- condensed to four simple words, "No, there are none" -- was sent winging across the eternal darks of interstellar space on soundless vibration Then, throughllongyyears while those vibrations traveled at the speed of light, the solar system waited, the masses in their blissful ignorance, the intelligences with an awe-filled forboding--- all wondering what effect our answer would have on the worlds of our sister star. Exact calculations were entered into determining within possible seconds, depending upon the unpredictable human or in human elements involved, the precise time which must elapse for our message to reach its destination and be acted upon. 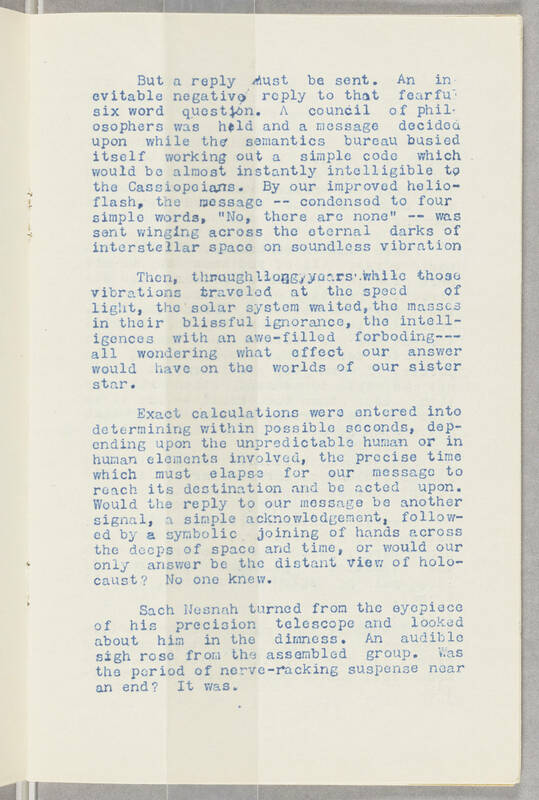 Would the reply to our message be another signal, a simple acknowledgement, followed by a symbolic joining of hands across the deeps of space and time, or would our only answer be the distant view of holocaust? No one knew. Sach Nesnah turned from the eyepiece of his precision telescope and looked about him in the dimness. An audible sigh rose from the assembled group. Was the period of nerve-racking suspense near an end? It was.